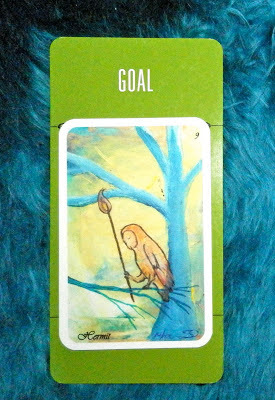 Today's Draw: The Hermit from Beth Seilonen's Owls Arcana in the Goal position from the Deck of 1000 Spreads. How do you avoid being alone with yourself? What are you afraid you might see? I look at this combo today and I think that the goal is for us all to be comfortable with ourselves as we are, alone. Which means, not the woman so-and-so loves, but the woman that loves herself. For being herself. Without needing any other form of affirmation. She, herself is enough. Whether or not anyone else deems her worthy. Personally, I think most people run away from themselves. "I'm too busy," "I don't see the point," and the hasty "I love myself, go talk to someone else" are all just euphemisms for "I'm afraid of what I'll find if I ever look." And, even as experienced at being alone as I am, I'll include myself in that group. I often see myself distracting myself in many ways...watching TV, fiddling with this or that...in an effort to not be seated entirely alone with myself. I know people who read a lot. That's not being alone with yourself. I know people who have to have to have the radio on in the background all the time. That's not conducive to being alone with yourself. Truly being alone with yourself is about taking the time to go within and just be. Alone. With yourself. With nothing to distract you. It's about seeing both your light and shadow sides and sitting in that, and that being OK. There is a part of me that craves this type of time. And too often, like I said above, I find ways to distract myself. It's hard to feel good about yourself in our society. Feel too good about yourself and you're arrogant. Don't feel good enough and you're self loathing. Feel just the right good about yourself and someone will come along to tell you how wrong you are. If you believe we create our own realities, then we created this, too. In the past I've seen how I've deleted negative people from my life in order to have a more positive surrounding to love myself in. I see how I've shielded myself from some in order to keep myself from being hurt. I see many ways in which I've held people—and even life—at arm's distance just to insulate myself from getting hurt. So that I can be better at loving myself. But the problem isn't out there. It's inside. It's in negative self talk and denial of shortcomings. It's in harsh self judgment and fear of shadow qualities. And it's in holding my true light in sway so as not to shine as brightly as possible. So as not to call attention to myself. The people outside of us that "make us feel bad about ourselves" are just mirrors. Nothing else. And with all that going on in our own heads, it's no wonder why we avoid being alone with ourselves! We may not like what we see, and what then? Or worst of all, we may be surprised at all we are, then have to actually do something about it. We do so much to protect ourselves from hurt. We keep the shadows locked tightly within. But, ironically, looking inside and facing all our demons is the only true way to protect ourselves from life's slings and arrows. It's no surprise that that confident, balanced, divine part of ourselves that our soul lost touch with when it came to earth, can be easily found in the last place we'd ever look.